When the late Heinz Kohut defined psychoanalysis as the science of empathy and introspection, he sparked a debate that has animated psychoanalytic discourse ever since. What is the relationship of empathy to psychoanalysis? Is it a constituent of analytical technique, an integral aspect of the therapeutic action of analysis, or simply a metaphor for a mode of observation better understood via ‘classical’ theory and terminology? The dialogue about empathy, which is really a dialogue about the nature of the analytic process, continues in this two-volume set, originally published in 1984. 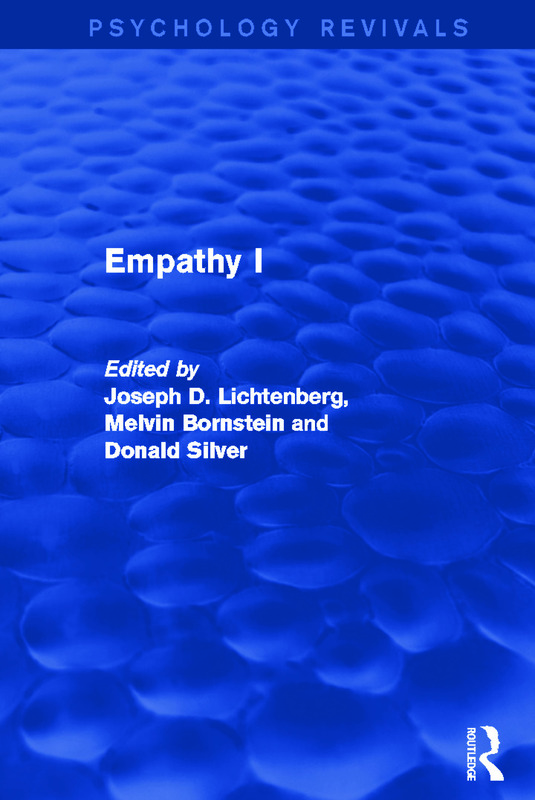 In Volume 1, several illuminating attempts to define empathy are followed by Kohut’s essay, ‘Introspection, Empathy, and the Semicircle of Mental Health.’ Kohut’s paper, in turn, ushers in a series of original contributions on ‘Empathy as a Perspective in Psychoanalysis.’ The volume ends with five papers which strive to demarcate an empathic approach to various areas of artistic endeavour, including the appreciation of visual art. Volume 2 continues the dialogue with a series of developmental studies which explore the role of empathy in early child care at the same time as they chart the emergence of the young child’s capacity to empathize. In the concluding section, ‘Empathy in Psychoanalytic Work,’ contributors and discussants return to the arena of technique. They not only theorize about empathy in relation to analytic understanding and communication, but address issues of nosology, considering how the empathic vantage point may be utilized in the treatment of patients with borderline and schizophrenic pathology. In their critical attention to the many dimensions of empathy – philosophical, developmental, therapeutic, artistic – the contributors collectively bear witness to the fact that Kohut has helped to shape new questions, but not set limits to the search for answers. The product of their efforts is an anatomical exploration of a topic whose relevance for psychoanalysis and psychotherapy is only beginning to be understood. Joseph D. Lichtenberg Acknowledgement. Joseph D. Lichtenberg Introduction Part 1. Toward a Definition of Empathy 1 Gail S. Reed The Antithetical Meaning of the Term ‘Empathy’ in Psychoanalytic Discourse. Evelyne Schwaber Discussion. Roy Schafer Discussion. James H. Spencer, Jr. Discussion 2 Louis Agosta Empathy and Intersubjectivity 3 Richard M. Restak Possible Neurophysiological Correlates of Empathy Part 2. Empathy as a Perspective in Psychoanalysis Joseph D. Lichtenberg Closing the Historical Circle: Remarks on Heinz Kohut’s Last Essay 4 Heinz Kohut Introspection, Empathy, and the Semicircle of Mental Health. Joseph D. Lichtenberg Introductory Remarks. 5 Theodore Shapiro Empathy: A Critical Reevaluation. Dan H. Buie Discussion 6 Stanley L. Olinick A Critique of Empathy and Sympathy 7 Pinchas Noy The Three Components of Empathy: Normal and Pathological Development 8 James S. Grotstein Some Perspectives on Empathy from Others and Toward Oneself 9 Stephen L. Post and Jule P. Miller Apprehensions of Empathy Part 3. Empathy in the Arts 10 Jerome D. Oremland Empathy and Its Relation to the Appreciation of Art 11 Mary Gedo Looking at Art from the Empathic Viewpoint 12 Hyman L. Muslin On Empathic Reading 13 Charles Kligerman The Empathic Approach to Biography 14 Warren S. Poland On Empathy In and Beyond Analysis. Author Index. Subject Index.